I can still remember the first time I had to pay a utility bill for my home. I was shocked at how expensive utilities were and how much I took them for granted. Heat, water, electricity are all lovely things to have, but they come with a price. I’ve gotten smarter over the years and have recognized that the simple things you do every day can help you save money. These are the five routines I have found to be the easiest way to save money on basic utilities. Rethink how you do laundry. I don’t know about you, but sometimes it feels like I am always doing laundry. Using hot water and running the dryer can really add a lot to your utility bill. I wash all of our laundry in cold water and find that it gets just as clean as when I used warmer (and more expensive) water. I try to use my clothesline as much as the weather allows, and even have a drying rack and retractable clothesline in my basement that allows me to hang dry things inside. Always make sure you run a full load of laundry (too little is a waste of resources and too much means your clothes won’t get as clean). If you must use the dryer, be sure to use the sensor dry feature. You can also try throwing a dry hand towel in the dryer with your wet clothes, as this can speed up dry time. You don’t need to use every light in the house all day. Open the curtains and let the sun shine in. In the winter, you can let that solar heat warm up your home. In the summer, close those shades and save on your air conditioning. Pick up some solar powered lights for your yard and let them do the work of lighting your yard at night. Get a rain barrel and let nature provide you with the water for your lawn and gardens. Go for a walk outside instead of using the electricity-powered treadmill. Be willing to push your limits on comfortable. Do you really need your home to be at a constant 72º F all day and night? Probably not. If you can learn to live with a little bit cooler temperatures in the winter and a little bit hotter in the summer, you can save 10 percent or more on your utility bills. The easiest way to do this is to get an adjustable thermostat that you can set to raise or lower the temperature when you are sleeping or away from home. If you’re going to spend money on utilities, you should really try to make the most of it. Always run full loads in the dishwasher and washing machine. If you’re going to bother to warm up the oven to bake a loaf of bread, bake four instead. This is probably the most important thing you can do to save money on utilities, and if you have kids, start teaching them to do this now! If you leave a room, turn off the lights. If no one is watching the TV, turn it off. Set up your computer so that it shuts off if no one uses it after awhile. Figure out what appliances and gadgets are using the most energy, and unplug them when you’re not using them. You can save on your water bill by not running the water while you brush your teeth. Avoid long showers with a timer switch. Consider whether you need to use the water or energy in the first place. You’re not just saving money on utilities when you practice these simple routines. You are also being a better steward of our planet’s resources. 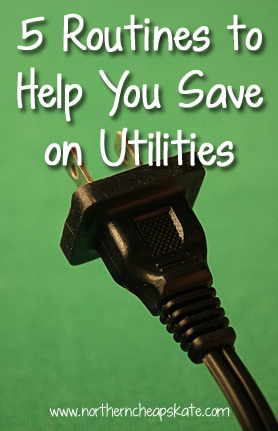 What routines have you established that help you save on utilities? Here in the deep south we are already pushing 92+ degrees with heat indexes of over 100! The front of the house faces directly west so when things begin to heat up we have styro foam panels that are placed in our office windows for the season. The windows have tint so you can’t tell there is anything there from the street. We also have infested in curtains with light blocking fabric as well as a fan light for our dining room window. It certainly does help! I too use a clothes rack but also just hang much of our clothes directly onto (plastic or padded) hangers after running them on the permanent press setting of the dryer for about 10 minutes. Less drying time means less energy but also saves wear and tear (and shrinkage) on clothes. I usually just re-hang them in the proper closets and they are dry at the end of the day. Mt. Neverest is so TRUE! Keeping a west-facing house cool is tough. I remember as a kid, my mom put up solar shades and that helped a lot in keeping the heat out. You can also save money by unplugging everything when finished. This will save $$ every month. I tried it. Evan when not using an item plugged up……it Still uses electricity. I unplug everything. I unplug everything, except for the frig, when not in use and also use timers. All my lights are CFL or led. My electric utility company was concerned my bill was so low they checked to make sure my meter was working correctly, it was! My budget amount is $26 a month and I have incurred a credit of $10.49 since June, 2015. If you visited me my home appears normal. A high power bill is not a necessity! That is amazing! Those little bits of energy saved add up to BIG savings! Thanks for sharing your inspiring story!